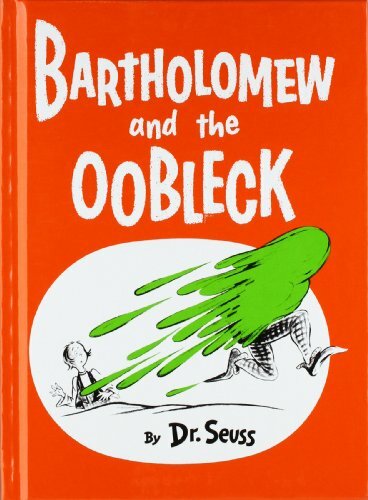 Bartholomew and the Oobleck easily qualifies as a Seuss classic, first told way back in 1949. And its message--the importance of owning up to your mistakes and saying that you're sorry--is as timeless now as it was then. Bartholomew Cubbins serves thanklessly as pageboy to King Derwin of Didd, a headstrong man who's decided he isn't satisfied with mere sun, fog, rain, and snow. ("Humph! The things that come down from my sky!") He wants something else, something uniquely his own, so he calls in his royal magicians ("Shuffle, duffle, muzzle, muff. Fista, wista, mista-cuff. We are men of groans and howls, mystic men who eat boiled owls"). Happy to oblige, the magicians tell the king they can make "oobleck" fall from the sky, only nobody--not even the magicians--knows just what oobleck is. But after a night of arcane incantations, everyone in the kingdom gets a taste of the stuff (in the case of the Captain of the Guard, literally! ), as the green, gluey goo gums up everything in sight.